Vital Reds is one those products everyone wants to buy its seems – this is without reading EXACTLY what it is and what is supposed do. Our main beef is that it’s $69 £50 – and the official site encourage you sign up on their autoship program. There are no coupon codes and no discount incentives! Vital Reds is a health-enhancing and energy boosting supplement brought to market by cardiac surgeon Stephen Gundry, who claims to be on a mission to “dramatically improve human health, happiness, and longevity” through his “unique vision of diet and nutrition”. The points to bear in mind about the Gundry MD organisation is that they have improved human health and immeasurably. There are many, many forums that validate this and testify to that fact. From the self health books to the Gundry Protocol there are many areas that Gundry MD have positively enhanced. As we at SlimmersWeekly are predominantly a weight loss resource we will look at Vital Reds from this perspective. So here goes. What Is Vital Reds and How Does it Work? The Vital Reds formulation provides a combination of probiotics and polyphenol-rich superfruit extracts. Polyphenos are micronutrients that are normally provided by plant-based food. They are rich in antioxidants that can help eliminate toxins from the body and are believed to support digestive health and provide a number of other benefits including weight loss. Probiotics are live bacteria and yeasts that improve gut health. Researchers are still uncertain how probiotics work, but they are generally seen in a favorable light and often referred to as “good bacteria”. Hence the availability of so many brands of probiotic drinks and yoghurts. Some of the health benefits associated with probiotics include allergy prevention and improved skin. Probiotics are also believed to be capable of supporting weight loss. Looking at the Supplement Facts, the presence of Vitamin B6 and Vitamin B12 stand out straight away. Both these vitamins are added to energy drinks because they help the body extract energy from food. Biotin is a B vitamin as well (B7) and it’s known to be necessary for healthy-looking skin, nails, and hair. 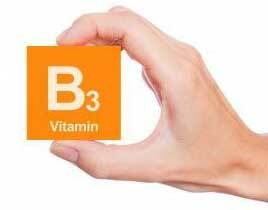 Niacin (Vitamin B3) lowers cholesterol and relaxes the blood vessels to provide improved circulation. Chromium is a mineral that can help prevent sugar urges. There can be no doubt about the potential value vitamins and minerals provide, but taking a good vitamin and mineral tablet would be a cheaper way to go; so let’s take a look at what else the formulation has to offer. The Polyphenol Blend is basically just an amalgamation of fruit and vegetable extracts, but it should be suitably rich in polyphenols, and several of the fruit extracts, including grapes, have a reputation for enhancing fat burning capabilities. The Metabolic Boosting Blend also has merit because studies show the green tea it contains is capable of boosting the metabolism and increasing energy expenditure for up to 24 hours. 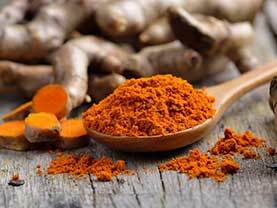 Turmeric also stands out as a good inclusion because it reduces inflammation and is sometimes added to diet pills intended to boost the metabolism without the use of stimulants. Unfortunately, the body has problems absorbing curcumin (key component in turmeric), so it’s great to see turmeric paired with black pepper because the piperine black pepper provides has been shown to increase curcumin absorption by up to 2000%. The Digestive Support Blend contains a hefty dose of probiotics that should benefit the digestive systems and improve the overall health. Fructooligosaccharides are natural sweeteners that are often used as a low-calorie alternative to sugar. Usage Instructions – Add one scoop of Vital Reds to 8oz of water (or your favorite beverage), mix well and consume as a drink. The Gundry MD website contain numerous positive reviews, but a number of Amazon reviewers complain it’s over-priced and does not work. The warning printed on the back of the bottle states new users should talk with their doctor before using any brand of supplement for the first time. This is standard advice. It’s also good advice. 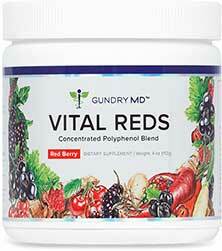 You can buy Vital Reds directly from the Gundry MD website or order it via Amazon.com. At face value, the Amazon price is generally the lowest, but the official site offers enticing discounts and incentives to customers who are willing to sign up to the Gundry MD auto-ship program and get a fresh shipment delivered every month. These kind of arrangements are often used in scams, but in this case everything appears to be above board. Customers are not being tricked with the offer of a “free trial” and the auto-delivery and credit card billing can be stopped with a single phone call. Vital Reds is backed by a 90-day money back guarantee, but any refunds issued will be less the shipping costs. The formulation of ingredients used in Vital Reds should be capable of delivering the health benefits the product has been designed to provide, but it’s value as a weight loss aid is more disputable. Some people using Vital Reds as part of a weight management program, that includes a low calorie diet, may find the product helps them obtain improved results, but Vital Reds lacks appetite suppressing ingredients, so sticking to a diet is still going to be hard work. The price of the product is also an issue. A number of customers complain the pot size is too small and the cost of the product too high. If you are looking for an expensive supplement that may improve your overall health, Vital Reds may do the trick. However, if you want to loose weight quickly, without feeling hungry, you need to be looking at going with an alternative product instead. Although we wouldn’t recommend against buying the Gundry product as there are health benefits – as far as weight loss is concerned we would position PhenQ over and above it. 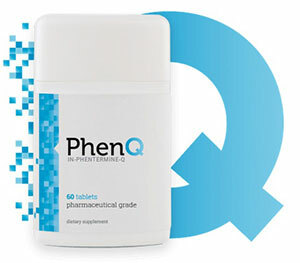 PhenQ offers multi benefits, a true multitasker that can offer a fat burning, fat blocking and appetite suppression experience all under one roof. The 60 day money back guarantee underpins it’s legitimacy. Copyright @2018 slimmersweekly.com | The information displayed on this website is to be used for information, Education and entertainment only. The information displayed on this website should not be used to form the basis of a medical diagnosis. We take our responsibilities very seriously and so recommend that if you have a condition, illness or disease seek medical attention from a qualified physician rather than a diagnosis online via any website. All information on this website, content, images and video is subject ti copyright law, this means you may not copy in whole or in part without consent from the owner of the website. To contact the owner of this website visit the contact page on the top menu bar.